Maybe it's leftover from our time in Sayulita, maybe it's just the heat. I mean, Memorial Day is the official start of summer after all. But for whatever reason, tequila's been my go-to lately. Exhibit: A. In any case, because I gave up soda and since I try to be careful of all the calories in a margarita, I haven't really known what to mix it with. Shots are fine, but I need an icy drink to sip on in order to deal with the sensation that I'm melting to death inside our house. So this weekend, I decided to experiment. I loved the flavors and the bubbles of that Raspberry Lime Tequila Sangria that I made last year and figured, if ain't broke don't fix it. The result became my drink of choice when my friends and I decided to play a drinking game while watching That Awkward Moment this past Saturday. Disclaimer: the combination will get you drunk. 1. In the bottom of a cocktail shaker, muddle the raspberries. 2. 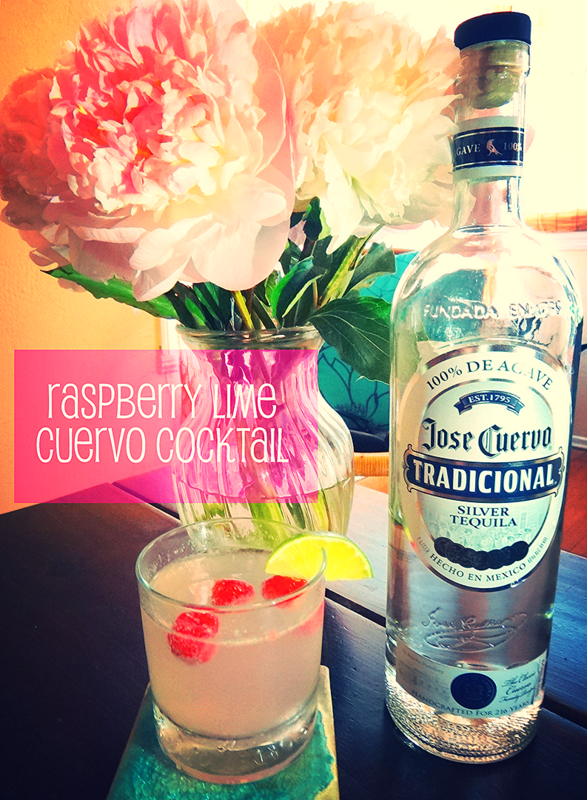 Add the fresh-squeezed lime juice, Cuervo and ice to the shaker and shake vigorously. 3. Pour into a cocktail glass, then top off with the lime-flavored sparkling water. While regular Cuervo is fine, the Tradicional® Silver is made from 100% blue agave so it tastes a lot better in this cocktail than most other silver tequilas would. And juuuuust so you know: This post was sponsored by Jose Cuervo but all resulting drunk texting was my own.